Please consider these submissions and include all their recommendations in the Mayor’s AQS. The Mayor’s draft AQS is a start but it is not yet ‘fit for purpose’. To become ‘fit for purpose’ it should apply the Precautionary Principle to tackle a serious public health problem and must show how air quality laws will be complied with in full. CCAL has agreed with government officials that some 3,000 premature deaths occurred due to exposure to dangerous airborne particles (PM2.5) in London in 2005 (even assuming average UK population- weighted exposure) and that the number may have been 6,900 (again assuming average UK population- weighted exposure). At the higher level that would represent one in eight deaths in London in 2005. Professor Nino Kunzli estimated in 2001 that the amount of time lost per statistical victim is 9.8 years equating to some 0.6 years in the total population (i.e. seven to eight months). Please recognise the scale and urgency of this public health crisis in the Mayor’s AQS. The Greater London Authority Act 1999 (GLA Act) requires that the Mayor of London’s AQS contains ‘… policies and proposals – for the achievement in Greater London of the air quality standards and objectives prescribed in regulations made under the Environment Act.’ In ‘Mayor answers to London’, you have admitted to Mike Tuffrey that ‘expected’ compliance with PM10 limit values is ‘subject to: detailed concentration modeling; and – importantly – to full funding of the programme and support from boroughs and central government’. You have stated that concentrations of oxides of nitrogen (NOx) need to be reduced by some 80% to ensure compliance with the limit values for nitrogen dioxide (NO2) by January 2015 and yet your AQS plans shows only reductions in emissions of NOx of 35-40% by 2015. You have omitted to address other air quality laws also e.g. the need to ensure annual average concentrations of NO2 remain below 60 micrograms per cubic metre (μg/m3) from 1 January 2010. This is not good enough. Please recognise the scale and urgency of these legal duties in the Mayor’s AQS and comply fully with relevant health-based laws throughout London. 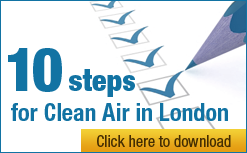 In CCAL’s view, the Mayor has the legal powers necessary to ensure full compliance with the European Union (EU) limit values for PM10 throughout London by June 2011 (or forthwith if the UK fails to obtain a time extension for PM10, as seems likely). Indeed, London is the only city in the UK expected still to breach those standards by that date. In contrast, over 100 cities and towns across the UK are expected to breach limit values for NO2 from January 2010, with London experiencing the highest concentrations of any capital city in western (or eastern) Europe. In CCAL’s view, the limit values for PM10 could be achieved quickly through the adoption of sensible transport policies (e.g. a Berlin style inner low emission zone) whereas the latter will require ‘everything including the kitchen sink’ (backed by numerous national initiatives and funding). CCAL is particularly concerned that the Mayor is taking ‘one or two steps backwards’ on air quality when ‘one or two bold steps forward’ are required. The delay of Phase 3 of the LEZ and the removal of the WEZ seem certain, based on the draft AQS, to result in an unnecessary and unacceptable health burden on the public and exacerbate breaches of air quality laws. This is totally unacceptable. CCAL urges you to implement one or more inner LEZs by early 2011. CCAL is concerned that you may have wrongly dismissed such an approach by wrongly weighing the costs and benefits of a Euro 4 inner zone with a Euro 3 outer zone when you should have considered the same standards for both (since the standards must be met in inner London whether through a carefully chosen inner zone or a blunt outer zone). A transect of London for annual average concentrations of oxides of nitrogen demonstrates this situation clearly (attached). CCAL urges you to go from ‘zero to hero’ simultaneously on environment, transport and public health matters. You could achieve a wonderful legacy for London by ensuring full compliance with air quality laws by the 2012 Olympics and put in place measures that will surely save thousands of lives. Please show the world how air pollution can be tackled successfully in all large cities including London. Poor air quality is a major public health issue in London. London is well known for having the worst air quality in the UK and amongst the worse in Europe. Without robust, early action, the UK is set to breach health-based air quality laws in London every year up to and including 2012 (and thereafter). CCAL therefore wrote to you, in a letter dated 20 September 2009, urging you to tackle fully and urgently this public health problem and apply the Precautionary Principle when developing your AQS (including government recommendations for sensitivity analyses). It is particularly disappointing therefore that you have failed to include any estimates for the health impact of poor air quality in your draft AQS. CCAL therefore urges you again to do so when determining the extent of policies and proposals needing to be included in the draft AQS for public consultation. CCAL’s letter of 20 September is attached and should be considered part of this submission. CCAL was invited to meet government officials on 21 October including the Health Protection Agency (HPA) to discuss the letter of 20 September and agree the health impact of poor air quality in London. CCAL and the HPA have agreed that some 3,000 people died prematurely in London due to dangerous airborne particles (PM2.5) in 2005 (using the latest recommendation of the Committee on the Medical Effects of Air Pollutants (COMEAP) of a 6% coefficient and assuming only UK average populated- weighted exposures in London). CCAL and the HPA have also agreed, using a similar recommendation and assumption, that a plausible upper limit may be 5,600 (using a 12% coefficient) and the actual number of premature deaths may have been 6,900 (using a 15% coefficient) (out of some 52,995 total deaths in Greater London in 2005). The detailed method and calculations are shown in Appendix One. These are shocking numbers and exclude deaths from other forms of air pollution e.g. ozone (O3) and sulphur dioxide (SO2). vi. the Defra team pointed out the health costs referred to on page 9 of the letter are ‘societal’ values not the cash cost to the Department of Health. ii. for the most recent year possible, the number of premature deaths due to PM2.5 (and preferably all air pollution) in Greater London using 6%, 12% and 15% coefficients (and, if necessary, say 65%, 70% and 75% ratios for PM2.5 to PM10). A reply is awaited but still expected. The HPA team expressed concern that the number of premature deaths should be presented in a bar chart to show how the number of premature deaths would fall gradually over time as concentrations of dangerous airborne particles fall. CCAL agreed this approach would be useful but pointed out that it would need to show also the number of deaths due to PM10 and/or PM2.5 between the years, say, of 2000 and 2010 with a line showing actual population-weighted exposures to particulate matter over the same period i.e. not assuming sharply falling concentrations due to optimistic modeling. The numbers estimated to die prematurely due to poor air quality have risen sharply in recent years as large scale, long term scientific studies have been completed. CCAL urges the Mayor therefore to be ‘upfront’ with people about the sheer scale of the risks in a way that means something to people i.e. not using abstract concepts for the entire 61 million UK population such as total (i.e. millions of) years of life lost and/or reduction in average life expectancy of up to seven to eight months nationally. In CCAL’s view, people should be told that up to one person in eight who died in London in 2005 may have done so due to exposure to dangerous airborne particles (assuming only average UK population- weighted exposures in London). Research published in 2001 by Professor Nino Kunzli suggests that those who die prematurely due to dangerous airborne particles may do so, on average, 9.8 years early. The health impact of poor air quality is similar or greater to that for alcoholism, obesity and/or smoking. iv. a limit value is a [concentration] to be attained and not to be exceeded once attained (Article 2 of the new AQ Directive). You will be well aware that the UK has applied for a time extension to comply with the EU limit values for PM10 until June 2011 with the European Commission due to reach its decision by early February 2010. In CCAL’s carefully considered view, the UK is not entitled to such a time extension. If the UK’s time extension is rejected, the UK must comply forthwith with the EU limit values for PM10 and the Mayor’s AQS must show how this will be done. As you know, at least five non-governmental organisations have written to the European Commission since the draft AQS was published urging it to reject the UK’s application for a time extension to comply with EU limit values for PM10. In significant part they have written because the draft AQS is inadequate. Please ensure that your AQS includes policies and proposals for the achievement of these obligations. In CCAL’s considered view, the draft AQS is a start but it is not yet ‘fit for purpose’, primarily for the health and legal reasons set out above. Despite these fundamental failings, some good work is included in the draft AQS. CCAL urges the Mayor to define a bold vision for his AQS around: seeking a reduction in hazardous concentrations to the point they do not harm human health; and compliance forthwith in full with air quality laws. The AQS needs also to define clearly responsibility, authority and accountability for the delivery of his AQS. ‘Wedges’ should be used to show graphically how and when concentrations will be reached. Please consider these submissions and include all their recommendations in the AQS. Edward’s research demonstrates clearly the dangers of the government’s myopic focus on carbon dioxide emissions instead of looking at air pollution holistically (including the need to protect public health), particularly in cities where air quality is poor e.g. London. CCAL would welcome an early opportunity to present these results to TfL and your air quality team. The research is being emailed separately to your team. CCAL supports the measures proposed in Policy 1 but they must be implemented ambitiously and successfully instead of becoming ‘busy fool’ ideas that sit on the shelf and look good but achieve nothing. Action: CCAL and Edward Townes urge you to ensure that the Mayor’s AQS takes comprehensive consideration of vehicle emissions in London. CCAL supports the measures proposed but they must be implemented ambitiously and successfully instead of becoming ‘busy fool’ ideas that sit on the shelf and look good but achieve nothing. It is difficult to comment on this Policy because the measures proposed are largely unspecified, unquantified, untested and unfunded. CCAL assumes they are meant to be ongoing measures but that should be confirmed please in the AQS. It seems further that this Policy (and Policy 6 below) may be intended to mitigate the impact of the delay of Phase 3 of the low emission zone (LEZ) (from October 2010 to 2012) and the possible removal of the Western Extension Zone (WEZ) of the Congestion Charging Scheme. In general, CCAL supports a widespread, systematic approach to improvements in air quality to tackle hotspots rather than hotspot measures per se (although the latter are clearly required if the former is inadequate). This is because: air quality standards are only as loose as they are because laws require them to be met everywhere, thereby forcing much wider health benefits; they are more reliable and cost effective; and they are less disruptive. Crucially though, standards must be met everywhere. iii. a paper obtained from the government under the Freedom of Information Act (attached) which shows that hotspots are expected to be fairly widespread still by June 2011 and exist on a number of the busiest roads in central London – even before the delay of Phase 3 of the LEZ and the removal of the WEZ. CCAL has responded separately in relation to Phase 3 of the LEZ under Policy 5 below. The Mayor has stated under this policy heading on page 40 of the draft AQS that he is minded to remove the WEZ. In the Draft Revised Mayor’s Transport Strategy Integrated Impact Assessment: Appendix E: Report on the Removal of the Western Extension Zone (dated October 2009), Table 3.3 on page 20 addresses ‘Impacts of removing WEZ in 2010 compared to conditions in late 2007/early 2008. Table 3 predicts an increase in circulating road traffic of 15-20% (vehicle kilometres) and an increase in congestion of 11 to 18% (minutes per kilometre) within the extension zone. Emissions of PM10 and NOx are predicted to increase by 4 to 8% respectively within the extension zone after its removal. These are large increases contrary to the impression the strategy seeks to portray i.e. up to 20/30% of all gains by 2012 and/or 2015 (and they are certain, already being in place). The government has made clear that if the Mayor removes the WEZ it expects him to replace it with equal or greater measures to improve air quality. At least, in part, this is because concentrations of PM10 (and NO2) set by the limit values have now been achieved in places within the WEZ and cannot again be exceeded. More specifically, irrespective of weather-effects, air quality laws require that once attained the daily limit value for PM10 cannot be breached on a single day after the 35 days allowed. This is a reasonable requirement designed to ensure widespread, systematic reductions in air pollution not adhoc ‘sticking plaster’ type measures to eliminate hotspot problems. In CCAL’s carefully considered view, Mayor Johnson would put the Secretary of State for Environment Food and Rural Affairs in breach of his statutory duties with respect to air quality if he removed the WEZ and then failed to ensure limit value concentrations are then met everywhere they are currently met, irrespective of future weather conditions. Thurloe Place, which sits between Brompton Road and Cromwell Road, is a good example of this issue since the daily limit value for PM10 is now met there. It is unlikely that this limit value would still be met if traffic volumes increase sharply as expected upon removal of the WEZ (unless an inner LEZ is in place). Action: CCAL urges the Mayor to ensure robust compliance with EU limit values at air quality hotspots, wherever possible, through widespread systematic measures rather than a package of localised measures. If localised measures are needed to ensure compliance, they must be specified, quantified, tested and funded. CCAL supports road-user charging and advocates dynamic road pricing. CCAL opposes the removal of the WEZ unless it is replaced simultaneously by one or more inner low emission zones (preferably modelled on the Berlin scheme) that overlap fully the current WEZ. See Policy 5 also below. Page 26 of the draft AQS states that ‘Road transport is the dominant source of PM10 emissions in central London, contributing some 83% in 2006’. CCAL is very disappointed by the lack of ambition proposed for this Policy. For example, the age limit proposed for licenced taxis of 15 years by 2012 and 12 years by 2015 is very weak when these vehicles are estimated to produce some 25% of all PM emissions from road transport in central London. After acknowledging that the fitting of abatement filters has not been effective for taxis, the Mayor is then taking several years not even to get back to Euro 3 standards which were mean to be in place from July 2008. Pre-Euro 3 vehicles need to be replaced quickly with Euro 3 following. As such a big contributor to the health problem, surely taxi drivers should get financial support for upgrading their vehicles? iv. diesel trains entering within the M25 should be required to use ultra-low sulphur diesel and best available technology abatement devices by June 2011. Action: CCAL urges the Mayor to tackle this category of emissions effectively. Otherwise the Mayor will need to impose unreasonable burdens on other sources of emissions e.g. business and private individuals. CCAL is very disappointed by the Mayor’s approach to this Policy. For example, the proposal to delay Phase 3 of the LEZ from October 2010 to 2012 will delay reductions of over 15% in the number of people expected to be exposed to levels of NO2 exceeding the annual average limit value and over 15% of those worst effected by dangerous airborne particles. For details, please refer to Annex A titled ‘Summary of projected impacts on emissions, exceedances and population exposure’ in Scheme Description and Supplementary Information of the Public and Stakeholder Consultation for the Proposed Low Emission Zone. This situation is not acceptable, not least when air quality laws for both PM10 and NO2 are expected to be breached in the intervening period. A high degree of certainty is needed to comply with EU limit values for PM10 by June 2011 and ensure (at a minimum) that annual average levels of NO2 do not exceed 60 μg/m3 from 1 January 2010. Large and reliable measures are therefore needed. It seems incredible to CCAL that the Mayor should be delaying a crucial measure when public health laws are being breached so substantially. On several occasions, CCAL has urged the Mayor to consider one or more inner low emission zones to ensure that air quality is improved rapidly, reliably and cost effectively in London. In particular, CCAL continues to urge the Mayor to include a Berlin style LEZ in inner London (to include the whole central and western extension of the congestion charging scheme and the boundary roads). Please see two attachments which detail the impact of that scheme. CCAL is concerned that the Mayor may have failed adequately to assess such an inner LEZ. When assessing such a proposal, the key metric should be to ensure the most cost effective means of complying with legal obligations. It seems obvious to CCAL that if Euro 4 standards (for diesel vehicles) are needed throughout central London by January 2011 and Euro 5 standards by January 2015 that it will be much more cost effective to adopt measures only where they are required rather than across the whole of Greater London. In other words, the Mayor should be weighing the inputs (e.g. costs) to achieve certain outputs (e.g. concentrations) of a Euro 4 (and then Euro 5) inner LEZ against the same standards simultaneously, London-wide (i.e. at the current boundary) i.e. the Mayor should not be comparing a Euro 4 inner with a Euro 3 outer (or Euro 5 inner with Euro 4 outer). Clear thinking is needed by the Mayor and his advisers on this issue or huge and unnecessary disruption will impact many Londoners. Action: CCAL opposes strongly the delay of Phase 3 of the LEZ and urges the Mayor to introduce by January 2011 one or more inner LEZs along the lines of the Berlin scheme (i.e. to coincide with the possible removal or the WEZ or otherwise). If an inner LEZ is working effectively, it may be possible then to delay further tightening of the outer LEZ. It is difficult to comment on this Policy because the measures proposed are largely unspecified, unquantified, untested, unfunded and adhoc. CCAL assumes they are meant to be ‘emergency type’ measures but that should be confirmed please in the AQS. It seems further that this Policy (and Policy 3 above) may be intended to mitigate the impact of the delay of Phase 3 of the low emission zone (LEZ) (from October 2010 to 2012) and the possible removal of the Western Extension Zone (WEZ) of the Congestion Charging Scheme. they fail to understand the likely disruption that would be caused by such measures. Berlin looked at such policies in 2005 and concluded that this measure is not proportionate e.g. because general driving bans do not adequately differentiate between polluters and it is essential to supply the city and to remove urban waste. Berlin concluded further that even if such measures were not chaotic they would still fail to achieve the necessary effect because some 70% of the PM emissions arise from outside sources on high pollution days. Action: CCAL urges the rejection of Policy 6 except as a last resort if the Mayor has failed to tackle the air quality challenge in a systematic and effective manner. The failure of the Olympic Delivery Authority to adopt fully the ‘Best Practice Guidance for the control of dust and emissions from demolition and construction’ at the Olympic Park and elsewhere is lamentable. It must trigger a call to action to require legally their full adoption on all public sector and major private sector projects throughout London. Action: CCAL urges the Mayor to require legally the full adoption of these polices and proposals on all public sector and major private sector projects throughout London. Substantial progress has been made in recent decades in building and construction technology. Please take full advantage of this and require each new or replacement building to be air quality positive by 25% or more. This should not be difficult for developers to achieve and would offer substantial co- benefits for energy efficiency and climate change. In other respects CCAL supports the measures proposed but they must be implemented ambitiously and successfully instead of becoming ‘busy fool’ ideas that sit on the shelf and look good but achieve nothing. Action: CCAL urges the Mayor to require each new or replacement building to be air quality positive by 25% or more. A full study should be undertaken to assess the potential scale of benefit that could be achieved. Substantial progress has been made in recent decades in building and construction technology. Please take full advantage of this and require each new or replacement building to be air quality positive by 25% or more. This should not be difficult for developers to achieve and would offer substantial co-benefits for energy efficiency and climate change. Action: CCAL urges the Mayor to require each new or replacement building or initiative to be air quality positive by 25% or more. A full study should be undertaken to assess the potential scale of benefit that could be achieved. CCAL is concerned that ‘living walls’ may be encouraged at the cost of losing public space i.e. it may be favoured by developers to intensify development. Action: CCAL urges the Mayor to define clearly his proposals and the contribution they are expected to deliver. A full study should be undertaken to assess the potential scale of benefit that could be achieved. the AQS needs to take account of actual population exposure to dangerous airborne particles and other air pollutants not just residential exposures. For example, as you know, very large numbers of people visit London’s two international shopping centres of the West End and Knightsbridge either as visitors or workers. Research on personal exposure to air pollution has highlighted the cumulative effect of such exposure. Please ensure that the benefits assessed by the strategy include the benefits of reducing personal exposure to these large numbers of people. The health and legal imperatives make necessary urgent action to improve air quality in London. – the Mayor implementing one or more Berlin style inner LEZs by 1 January 2011. – everything including the ‘kitchen sink’. CCAL has seen the Mayor’s list of requirements to be met by the government and supports it fully (attached). CCAL encourages the government and the Mayor to seek a ‘win-win’ outcome for themselves and Londoners. iv. the 2015 version of the inner LEZ being be applied during the 2012 events, for as many vehicle categories as necessary, to showcase London’s vision for the future and achieve the required reductions in traffic volumes in an environmentally friendly and healthy manner. 10. a convincing plan to tackle the challenges and opportunities offered by the Queen’s Diamond Jubilee and the Olympics in 2012 e.g. the Olympic Route Network. Please acknowledge receipt of this letter to the email address provided separately and respond to CCAL on the action points raised in this letter. Note that Defra assumed (on page 87) the level of non-anthropogenic PM2.5 to be constant and estimated it to be about 3.37 μg/m3 annual average population-weighted mean. v. applied the recommendations from COMEAP’s 2009 Report to use a coefficient of 6% per 10 μg/m3 of PM2.5 as the best estimate of Attributable Deaths, with a sensitivity of 12% and a wider interval of 15% (which COMEAP said should be used in any report on quantification of risks from long-term exposure to air pollution represented by PM2.5). CCAL and the HPA have therefore used the above log-linear function to scale the results to ensure an accurate number and applied the resulting RR to the number deaths of people of 30 years of age and older.